Complete spectrum cleaning for larger spaces. Safe, Clean Air in Your Home! Feel Better Knowing Your Family is Sleeping Soundly while Breathing Clean Non-Toxic Air! 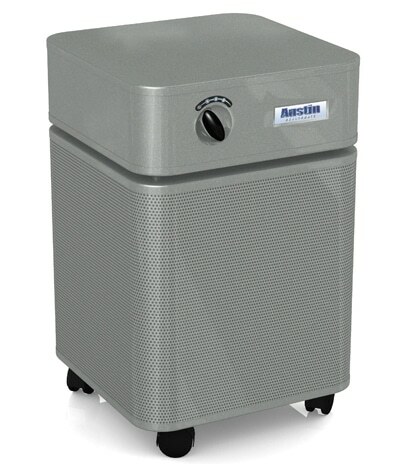 The Austin Air HealthMate Air Purifier and HealthMate Jr. Air Purifiers are Austin Air’s “standard” unit that provide complete spectrum cleaning to keep your air pure and healthy. The HealthMate is ideal if you have asthma, allergies and/or chemical sensitivities. 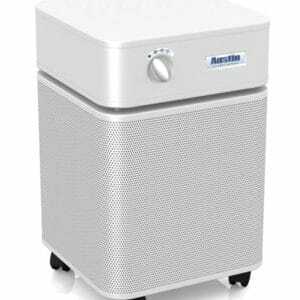 It removes molds, spores, pollen, pet dander, odors, VOCs, gasses, chemicals, and fine particulate matter from air pollution. It is certified to remove 99.97% of all airborne particles 0.3 microns and larger. The HealthMate is effective for an area up to 1500sq/ft, assuming average residential ceiling heights of 8 ft. It provides effective coverage of large household living areas, small apartments and offices. 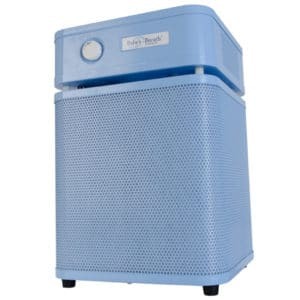 The HealthMate Jr. is the smaller version of the HealthMate Air Purifier. 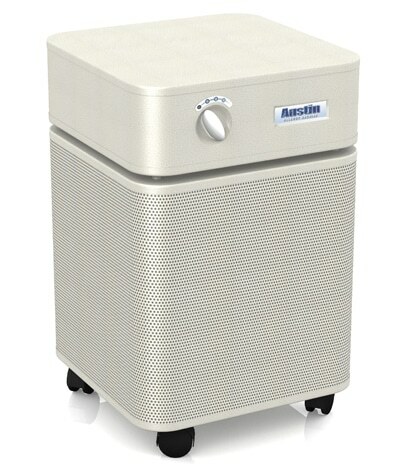 The Austin Air HealthMate Jr. is the perfect bedroom air purifier – designed for removing air pollutants in single rooms. Effectively cleans an area of 700 sq. ft. (with normal ceiling heights up to 8′). Stands 16.5” tall and 11” x 11″ wide. Weight is 18lbs. 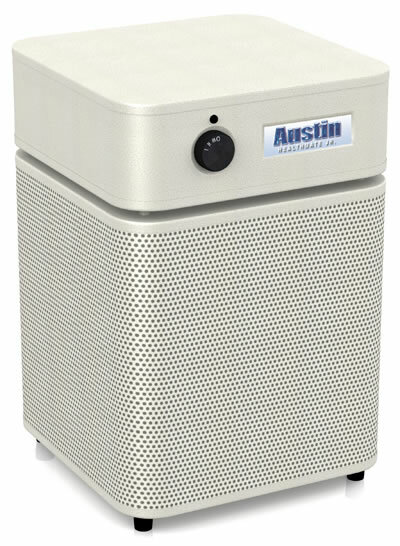 Austin Air HealthMate and HealthMate Jr. come ready to use. 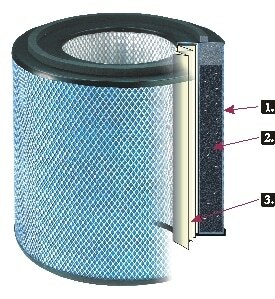 No need to change or clean filters every three months – the filter lasts five years! 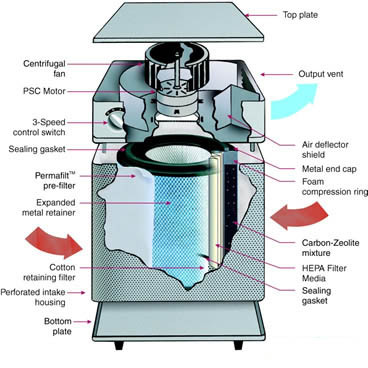 Simply plug it in, turn it on and enjoy five years of clean air before changing the filter! 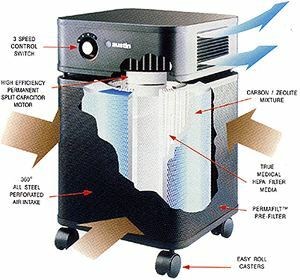 The addition of zeolite gives this unit coverage for formaldehyde and ammonia; however the HealthMate Plus units provide the best, most effective removal of formaldehyde and ammonia. STAGE 3 – About 15 lbs. of Activated Carbon and Zeolite. Removes odor, gas, and chemicals – with a ‘Miracle Inch’ of complete protection. STAGE 4 – 60 sq.ft. of Certified True Medical HEPA. Removes 99.97% of all particles larger than 0.3 microns. Other air purifiers use granulated carbon to adsorb chemicals and noxious odors. But only Austin Air’s HealthMate and HealthMate Plus offer the Miracle Inch of protection. 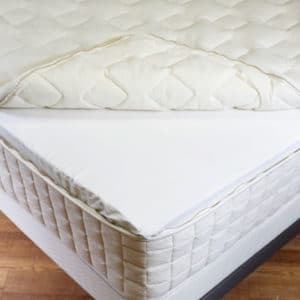 This inch-thick barrier of carbon & zeolite mix acts like a sponge, scrubbing toxic gases and odors from the air, before they reach the HEPA paper. 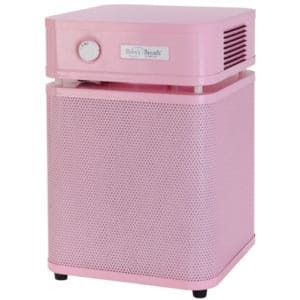 No other air purifier has this.